A team successfully separated 10-month-old conjoined twins during an 11-hour surgery, Children's Hospital of Philadelphia said Tuesday. The hospital said sisters Erin and Abby Delaney, of North Carolina, are recovering in the intensive care unit after last week's procedure. The surgery was carefully orchestrated, down to marking monitors and equipment with green or purple tape, one color assigned to each girl. Taylor is a plastic surgeon who helped lead the multidisciplinary team of about 30 people. 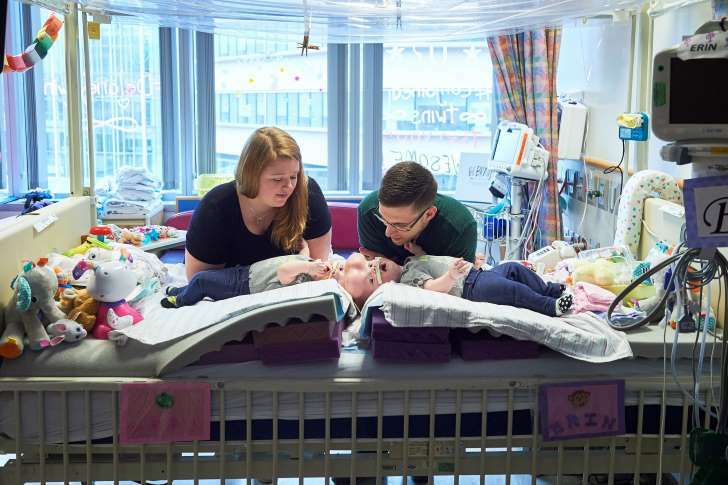 It marked the 23rd time the hospital has separated conjoined twins over the past 60 years and the first involving children joined at the top of their heads, the least common type of conjoined twins. That condition is known as craniopagus. Their shared blood vessels and a protective membrane around their brains were carefully separated before the team split into two groups to perform reconstruction involving each patient. The girls were born 10 weeks prematurely in late July by cesarean section. The hospital said they are now in separate beds for the first time in their lives. Additional surgery is considered likely. The girls are expected to return home later this year. The hospital declined to disclose the family's hometown.